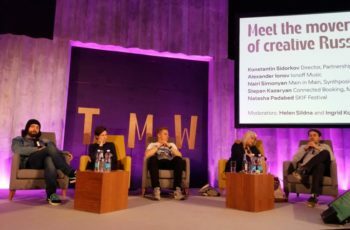 Tallinn Music Week 2018 conference (Part I): social networks – boosters of new artists? This year’s Tallinn Music Week conference was multi-focused, with only about a fifth of all sessions related to music per se, which was a bit of a surprise. As its title was Creative Impact Conference, it embraced a wide range of spheres, from music distribution to underground revival, to city design to climate change. But let’s focus on TMW music talks and the most “buzzed” topics at Kultuurikatel over the past weekend. The conference panels devoted a lot of attention to an ongoing shift from sales charts and streaming statistics to complex success indicators and the soaring role of social media. While it’s true that today content often costs less to produce and spread the word about, it’s still often a challenge for artists to reach global markets through digital platforms. So the panelists from all over the world shared thoughts on how we could rebuild music business to make it more favorable to new talents and outside-the-box ideas. It has also become a Tallinn Music Week tradition to discuss music prospects and current trends in the neighboring Russian market. Having been a music journalist in Russia for more than 10 years, I couldn’t miss the talks on how Russia’s largest social network is breaking the patterns of releasing and marketing music, skipping major labels and pressing contracts. Because VK’s trends today could soon be picked up by Facebook and the like and become the future of music worldwide sooner than we think. One of “the movers and shakers of creative Russia today”, social network VK (also known as VKontakte) delegated its representative, Konstantin Sidorkov, to share a success story of rapper Scriptonite (Kazakhstan), who managed to build his popularity in Russia almost from scratch via the social network. The rapper, who started off by posting about a dozen songs a month on VK, quickly reeled in wild numbers of subscribers. He soon landed a contract with a label and now has millions of fans all over Russia and headlines hip-hop festivals. Talents hunting for labels, or labels hunting for talents? The delegate of Tallinn Music Week’s “sibling”, Moscow Music Week, Stepan Kazaryan, highlighted another major change. Just ten years ago it was labels searching hard for new artists, offering big sums to sign them, and lacking performers to fill festivals’ line-up. “Now there are so many independent bands on the Russian scene that there is only one problem: which bands to choose”, concluded Russian panelists. Moreover, for today’s independent artists inking with a major label is not even a goal: some are happy with a smaller deal, as long as they can do what they love. Being content with a smaller-scale recognition and retaining creative freedom has proven to be this conference’s leitmotiv, in fact. “Many artists don’t even want to be part of a big label,” record executive/music manager Jeannette Lee told John Robb in a personal interview session. “There are different forms of management,” Lee pointed out. “Some bands want a more business format”, she explained, such as statistics and sales, while other artists have other priorities and don’t want massive media attention.